Have you ever wondered what to do with all of the stones and rocks your toddler piles into his or her pockets? Maybe you have amassed a large collection like I have. And if you are like me, you oblige the rock collecting to an extent and dutifully add them to the “collection”. Our rock collection is kept in an old ball jar. While you may lament this rock obsession toddler phase, don’t be fooled by the simplicity of the rock. It makes a wonderful addition to nature crafts. Not to mention, they are plentiful and free. 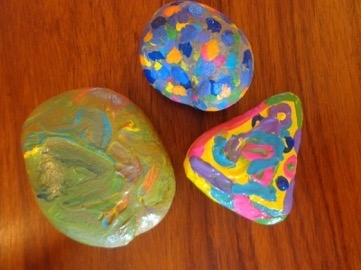 For our nature craft, we chose the larger rocks in our collection and turned them into painted paperweights. These make great gifts for grandparents, mother’s/father’s day, book ends, or just decorative fun art for your fireplace mantel, office, or garden. 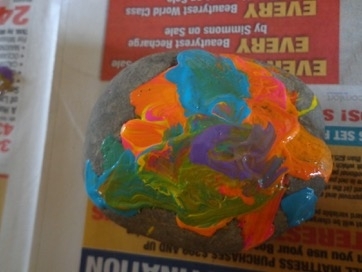 Painting rocks is also a hands on learning experience. We talked about which rock was the biggest, middle, and smallest in size. By chance, all of the rocks we used had different shapes; round, egg shaped, and triangle. This gave us the chance to discuss shapes and texture of the rocks. 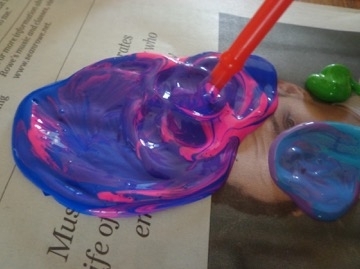 And most appropriately, we had a ton of fun with colors and mixing the paints to create new vibrant colors. Apart from the learning aspect, this craft was an amazing way to encourage discovery and creativity. We discovered that mixing all the colors together makes …well…brown. Not very exciting. However, creativity is in the hand of the artist. Each of us created a unique design and ended up marveling over each other’s handiwork. Here’s what you need to get started creating your own painted rock nature craft. Paint (crayola finger paint would work, however I purchased some paint at the craft store for $.99 per bottle). You could also use markers or sharpies to color and decorate with. How to create your rock-work. Take time on your next hike to indulge the ever curious little ones and help them scout some great rocks to paint. You just might find the perfect stone. Erin Vitali is a Branch Ambassador for Capital Region, NY. She lives in Albany with her husband (Mike) and daughter (Juliet). 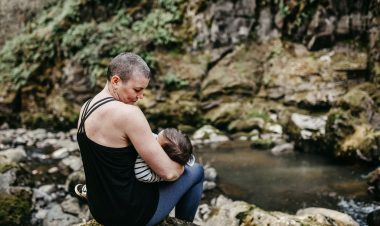 Joining Hike it Baby in October 2015 re-sparked her love of nature and has given her the courage to get out and explore all the beauty her region has to offer. You can also find her writing about her DIY adventures and motherhood at mrsmotherdirt.com. Off Trail crafts, green crafts with kids, nature crafts. permalink. Erin Vitali is a Branch Ambassador for Capital Region, NY. She lives in Albany, NY with her husband, daughter and fur babies. 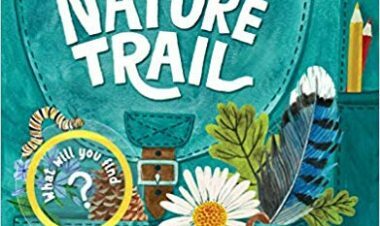 You can share and explore nature craft ideas with Erin here: https://www.pinterest.com/erinvitali/.